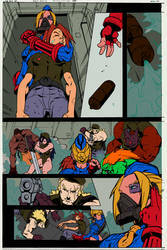 I am a comic book colourist, inker and letterer based in London. I'm also available for general graphic design work. Make sure to properly credit the art where ever you post it, and it may not be used for any form of commercial purpose without express permission from myself, and any other artists involved! Critique is always welcome - but please keep in mind, I am the Colourist on this piece, and the other artists involved may not want your critique. Thanks! Cheers! Look forward to sharing some love.